First season of the Monogatari Series, part 1/3. Contains the arcs Hitagi Crab, Mayoi Snail, Suruga Monkey, Nadeko Snake, and Tsubasa Cat from the Bakemonogatari light novels. Koyomi Araragi, a third-year high school student, just experienced a hellish spring break where he was attacked by and turned into a vampire. Though he restored his humanity with the help of Meme Oshino, a vagabond specialist in supernatural entities, some vampiric traits still linger. Regardless, Araragi tries to live a normal school life with the help of his friend, class president Tsubasa Hanekawa. When classmate Hitagi Senjougahara falls down the stairs and is caught by Araragi, he realizes that the girl is unnaturally weightless. 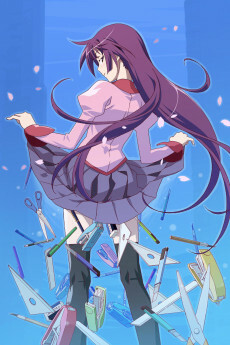 Despite Senjougahara's protests, Araragi insists on helping her, enlisting the aid of Oshino once more. Through several tales involving demons and gods, Bakemonogatari follows Araragi's attempts to help those who suffer from supernatural maladies reconcile with their past.